This classic tri-fold brochure is an effective and economical marketing tool. 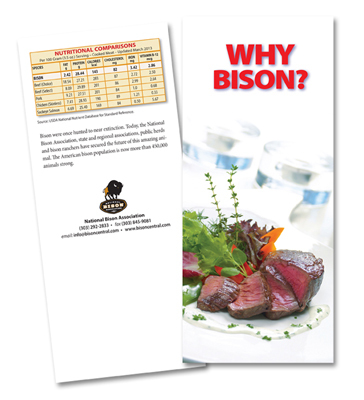 It educates your customer on Why they should eat bison with a brief overview of the responsible production practices, nutritional information, cooking tips and recipes. A large space is provided on the outside back of the brochure for you to stamp or place a label with your company information so customers can contact you and place orders!